Cozy crochet for your little ones. My 4 year old son LOVES red. He loves anything red. He has even changed his name from Ben to Lightning McQueen, because McQueen is red. He is a ball of energy and fun, and so I designed this hat with him as my inspiration. This is just the basic sock monkey pattern with a few variations. The sock monkey hat can be found on this blog or by clicking here. Everything is done the same up to the first round of row 7. Then I alternated rows of sc in red and dc in black. (After row 6 which is 2 rows of sc in red) There is a total of 5 rows of black dc with 4 rows of red sc in between. I gave him crazy eyes because plain black buttons didn't show up on the black yarn very well. The black pupil is the same as the first round as I use to make the ears, and then I did 2 sl st in each st around with white. To do the faux-hawk, I used 6 strands of yarn (2 of each color) and looped them around each dc post of the crown of the hat. I left them longer than I needed then I trimmed them all to the same length. They do not stand up if they are too long, so play around with the length. I really hope my variations make sense to read, because the sky is the limit with color combos you could do with this crazy monkey!! have fun, and I have started a new album on my facebook page called inspirations. I would love to see any other variations of this guy or any other creations you have on there! For a list of crochet stitches and how to make them go here. **You may use this pattern to sell items, but I request that a link or credit be given back to this site** This is a ©Knotty Knotty Crochet pattern, and may not under any circumstances be sold in whole or in part. Duplication is by written permission only. Sure. I will update the pattern soon so that it makes more sense. I just used the other sock monkey pattern on the blog and used different colors and gave him a mowhawk. I think he's so fun! If you like my free patterns, consider donating a small amount for them. Many patterns are sold on Etsy.com for around $5, but I am making my patterns available free of charge. I am a stay at home Mom of four, and crochet is my outlet. Any monies I make from this hobby are purely mine for my "fun" money, but usually goes to something for the children or bills, oh well! I will continue to provide free patterns here but might have more, more often, if there is a little fun money! Thanks for looking, and if you cannot afford anything, please don't feel obligated! Pretty & Plain little Mary Jane FREE crochet pattern! Hoot Hoot! 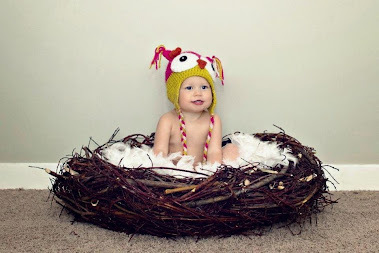 Owl hat FREE PATTERN!! LIttle brimmed hat FREE PATTERN! Free Sock Monkey hat pattern! Simple shells beanie FREE PATTERN! super bulky striped hat FREE PATTERN! sweet strawberry hat FREE PATTERN! I'm just a crocheting, homeschooling, kickboxing stay at home mom of four awesome kiddos, with a great hubby who puts up with my yarn addiction, kickboxing obsession and artistic tendencies. If you don't know what it is like being married to an artistic person, know that he is the real hero here. There are days when he gets home and the house looks like we have been robbed, there is no supper in sight and the kids are all messy with paint/glue/papier mache....and big smiles! He is constantly stepping over my latest crochet project, eating beside my art papers, and watching the kids so I can get my 3 hrs of boxing in per week that I love so much! I love all things creative, but mostly, love my guy!